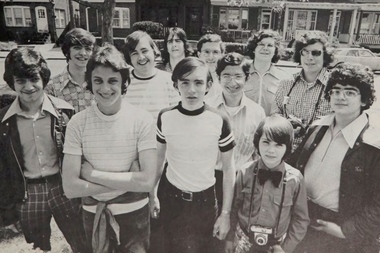 This is a picture taken in 1974 of the Xaverian High School yearbook students. BAY RIDGE — For the first time since its founding more than half a century ago, the all-boys Xaverian High School will open its doors to female students. Officials at the institution, one of the leading Catholic college prep schools in New York City, voted Thursday to allow girls to attend the school beginning in the fall of 2016. The school will also add a women's athletic program that includes soccer, volleyball, cross country, tennis, cheerleading, basketball, swimming, softball and golf. The move is part of the school's strategic plan, which also includes expanding extracurricular activities, strengthening admission requirements and the addition of facilities such as a new music rehearsal space and engineering and biomedical science labs. Xaverian Middle School, located in the same building at 7100 Shore Road, has been co-ed for more than two decades. “We wish to provide young women, including our own middle school students, the same opportunities for a Xaverian High School education that our boys have,” President Robert B. Alesi said in a statement. Over the next year the school will convert several boy's bathrooms to girl's rooms and create a female locker room. The school does not plan to expand its enrollment — this year there are 854 students — or significantly increase tuition, which is about $12,000 this year.